Beautiful captures. I love how you've captured the bee :-) Have a wonderful weekend. The bee is extraordinary. Fantastic shots, Maia. Just gorgeous. lovely pics! linking up my post...have a nice weekend to you too.. The bees is incredible! I have posted a lot of photos of chicory, as I love the colour. I did not know the leaves were edible. Your photos were taken later in the day than mine, as the stamens are starting to curl. Another little fact about chicory, and possibly other plants as well. I've seen this flower in my country, but they are mostly yellow,and due to our tropical heat, they bloom all year long. What a lovely flower! I've never seen one before. My grandmother used to always make her coffee mixed with chicory. I remember not liking it at first but then developed a taste for it. 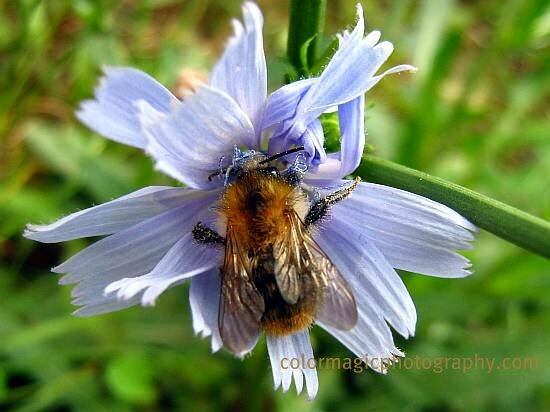 The bloom of the chicory plant is gorgeous, even more so when visited by a little honey bee. Beautiful macros Maia. That is a beautiful blue. There aren't many flowers that are pale blue. Lovely shots, Maia. Great macro shots. Beautiful blooms. Gorgeous chicory shots. Love the bee. Beautiful!! 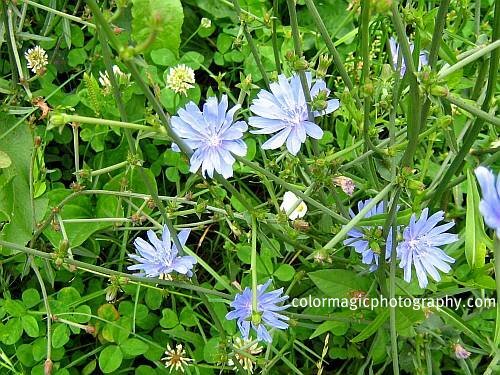 I love the color of chicory flowers - so soft... I also like chicory "coffee"! 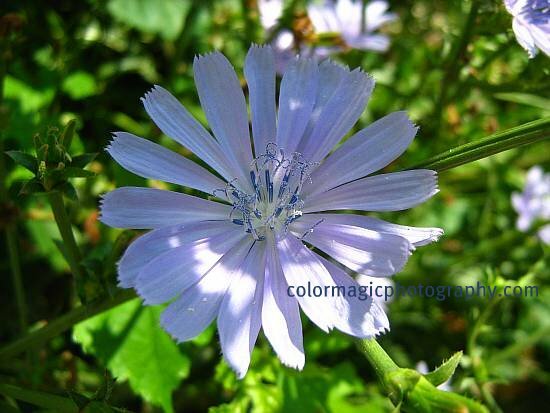 Beautiful photos of the lovely chicory! Achei linda a cor desta flor!A abelha parece que vai saltar da tela em minha direção! I'll translate for you on google translator: Here are some photos of my tulips when they were opening. Today is a special day for me, since I retired in the role of teacher of mathematics for students 11 to 17 years in public school. I changed a few words. I think now you can understand. Thanks for the compliments to my tulips, and also the affection in your comment. Have a happy weekend! Hugs!